We hardly had much of a winter in California and now we're going into spring. With the change in light from daylight savings day last weekend, I'm relishing in the extra light at the end of the work day. It's made me feel like I have more pep in my step! I thought this was just an old wives tale but, seriously, how many times did I walk into that room forgetting what I wanted to do? waking up several times in a night doesn't help me during the day but it is giving me a preview of my future! this doesn't happen all the time and I'm grateful I'm not heavily swollen - yet - but, the struggle is real! thankfully, this is also not an everyday occurrence but, as my doctor said, the extra weight I'm carrying has thrown off my center of balance so my body is compensating for it. OK, this isn't an excuse but boy can I go from bubbly to irritated in a second! Sorry, husband! Despite my discomfort, I know my overall pregnancy has been nothing compared to some women. I am grateful for the ability to still do a lot of things I typically do (exercise and being able to eat a lot of foods without feeling nauseous). And, above all else, all of this is temporary until I get to meet the baby! You look beautiful in your pictures. 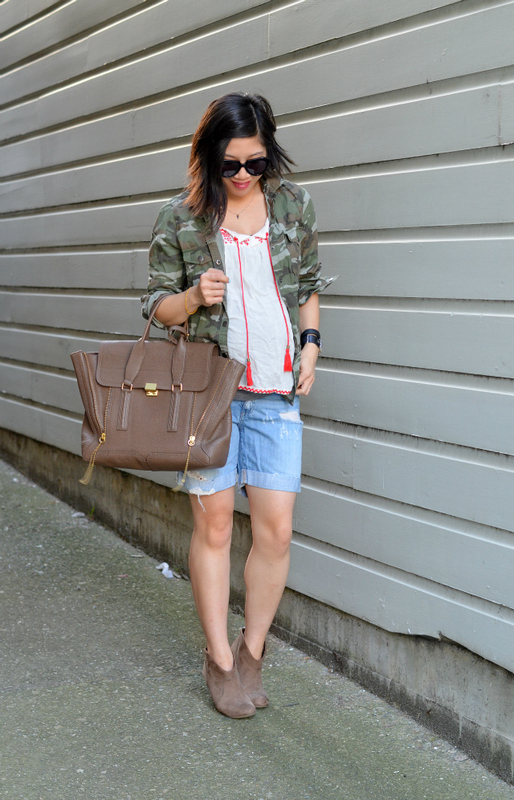 I have been loving a little camo lately and the tassels on your shirt are great. You look gorgeous!! and I love that bag! I hope you get through those transitions quickly Nancy. I've heard about them. HaHaHa You look beautiful! 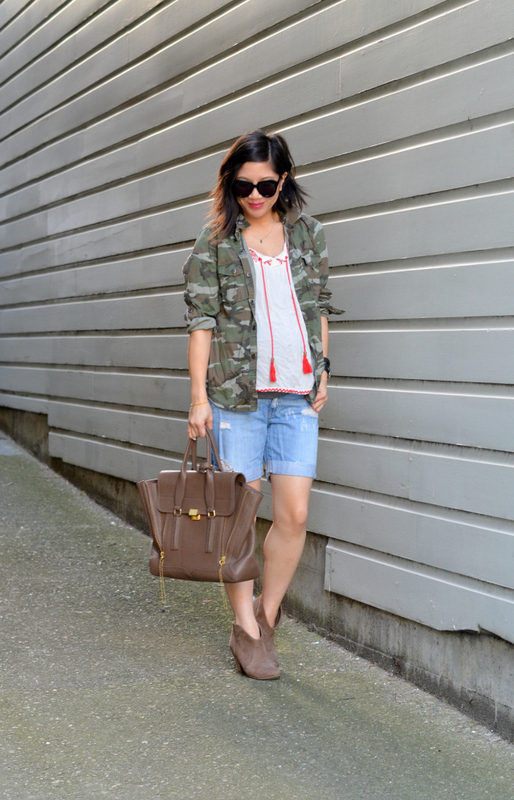 I like the mix of boho & camo in this outfit. I remember during my last trimester that I had such horrible sleep because i had to use the bathroom all the time. I do not miss those nights. You people are so lucky for having that amazing weather in Cali!! My favorite top of yours is back! ;) And I am definitely enjoying the extra light! I feel like I'm walking on air! 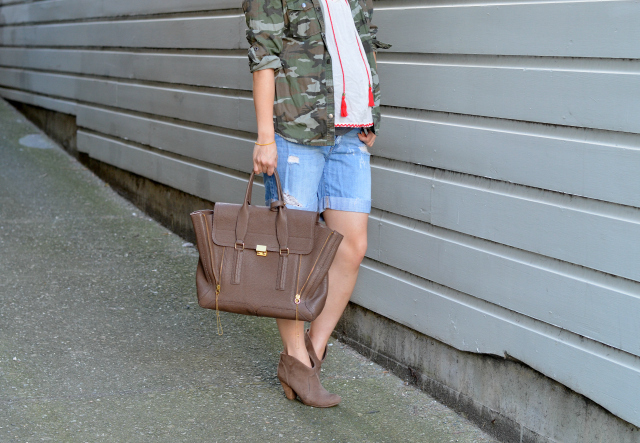 You look stunning- pregnancy looks good on you! This is a great transition in every detail - more power to your pregnancy too!!! Wow, what a wonderful look and I recognised only at the 3rd time you are pregnant. You are definitely a really beautiful pregnant woman! Thank you for your kind words on my blog. You have an amiable blog and now I wonder if you are interested in following each other? so glad you are rounding the corner! You look wonderful, love the camo jacket, and pretty blouse. Yes, all of that is consistent with your new trimester, and having a healthy baby! You look wonderful , and I still remember brain fog and mood swings 26 years later! 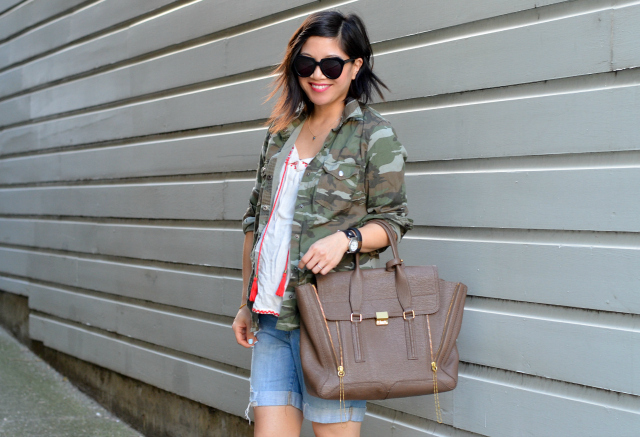 Love your top paired with the camo. I'm excited to break out my jeans shorts. Man I've missed everything being gone! Congrats on the impending parenthood! I love your style! 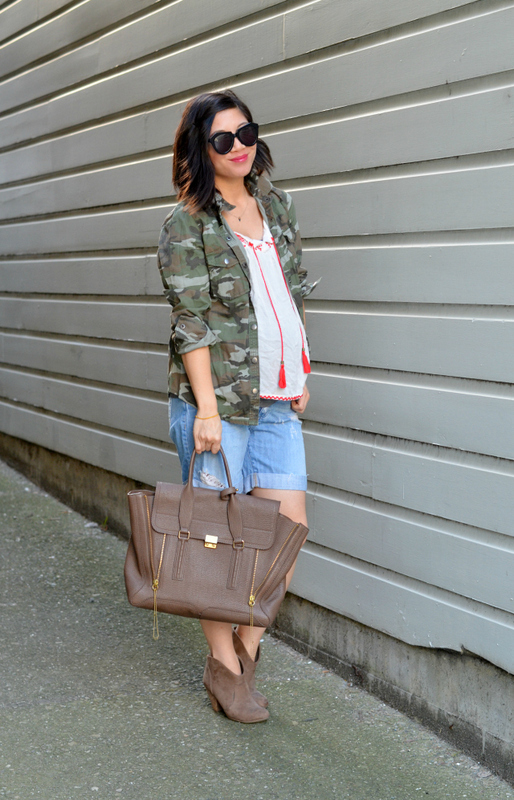 Not the typical maternity outfit and it looks great! You look absolutely amazing, Nancy! So happy to hear that everything is going amazingly with you so far. You are really glowing! I only hope I'll be so lucky when I'm pregant - I have a feeling I'll be a huge couch potato and feel nauseous all the time, lol! Cute outfit! The boots are my favorite!! So funny about pregnancy brain. I have not ever had children but was like you that I thought it was an old wives tale or an "excuse". I also have been thinking (so many pregnant friends, lots of exposure hahah) that perhaps the reason women have sleepless nights when they are pregnant is the body's way of prepping you for your baby? I mean, you mention it.. But I'm beginning to feel like there is some biological sense to that? LOL food for thought.